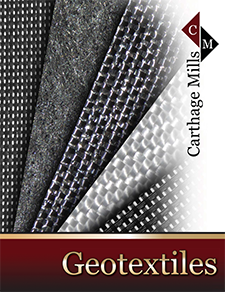 Carthage Mills' FX® High-Strength (PET) Series of woven polyester geotextiles were developed for the most demanding applications of reinforcement and confinement. The FX® High-Strength Series (PET) is produced of 100% high-tenacity, high molecular weight, multifilament filament polyester (PET) yarns. They deliver the higher ultimate tensile strength properties, resistance to installation damage, and exceptional creep resistance and soil interaction that results in higher long-term design strengths (LTDS) per GRI-GT7. Carthage Mills can custom manufacture FX® High-Strength (PET) geotextiles to meet individual project specifications up to approximately 55,000 lbs/ft Ultimate Tensile; in custom roll sizes; and with minimal lead times meeting difficult delivery requirements. Carthage Mills' FX® High-Strength Series (PET) of woven polyester geotextiles are designed to provide cost–saving solutions in a wide range of applications and varying site conditions, making them the logical choice for the most demanding of applications. CREEP RESISTANCE: The high-tenacity, high molecular weight, multifilament filament polyester (PET) yarns and weaving process delivers higher long-term design strengths (LTDS). REINFORCEMENT: High tensile modulus at low strains and excellent soil inter-action delivers immediate support in severe conditions. DURABILITY: Superior resistance to installation damage assures long-term performance. HIGH SEAM STRENGTHS: Easily sewn in the factory or the field high to wide widths and significantly decrease installation time. CUSTOM MANUFACTURE WITH MINIMAL LEAD TIMES: Manufactured to 'project specifications' with minimal lead times and on-time delivery. Note: Carthage Mills can custom manufacture FX® High-Strength (PET) geotextiles to meet individual project specifications up to approximately 70,000 lbs/ft Ultimate Tensile ; in custom roll sizes; and with minimal lead times meeting difficult delivery requirements. Call for a Custom Quote and delivery schedule.